Rotageek has a Gaps feature at the top of the Scheduler to indicate that a shift needs to be filled but is not yet assigned to a team member. 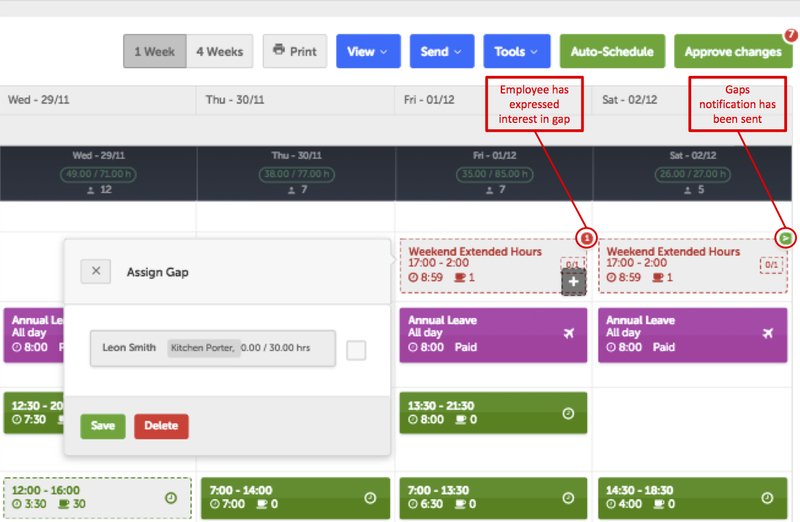 Gaps helps you to identify an employee who is available to work, and you can send notifications to your team asking if they would like to take on the extra shift. Gaps can be used in one store/location, or across multiple locations within your business. This enables you to draw on employees from other branches to provide cover when required. Add your unassigned shifts to the Gaps row in the Scheduler, just as you would add a shift to the Scheduler itself. You can either create a new gap or choose from the list of Existing Shifts. If the shift requires a specific type of employee or skill you can specify this here too. If you have more than one unassigned shift on a particular day, you can add multiple gaps in the same box. Once you've added your unassigned shifts to the Gaps row, the next step is to choose which employee you want to give the shift to. There are two possible options for choosing the person you want. To see a list of available employees on the scheduler, double click the gap shift. This will place a grey draft box on the scheduler against each employee who can take the shift. Available employees are those who don't already have a shift at that time, or who have not been marked as unavailable on that day. If you have specified particular skills or employee positions required for the shift, this will also be taken into consideration when finding available employees. To help you decide who you want to give the shift to, your employees' scheduled hours and contracted hours are displayed under their name. 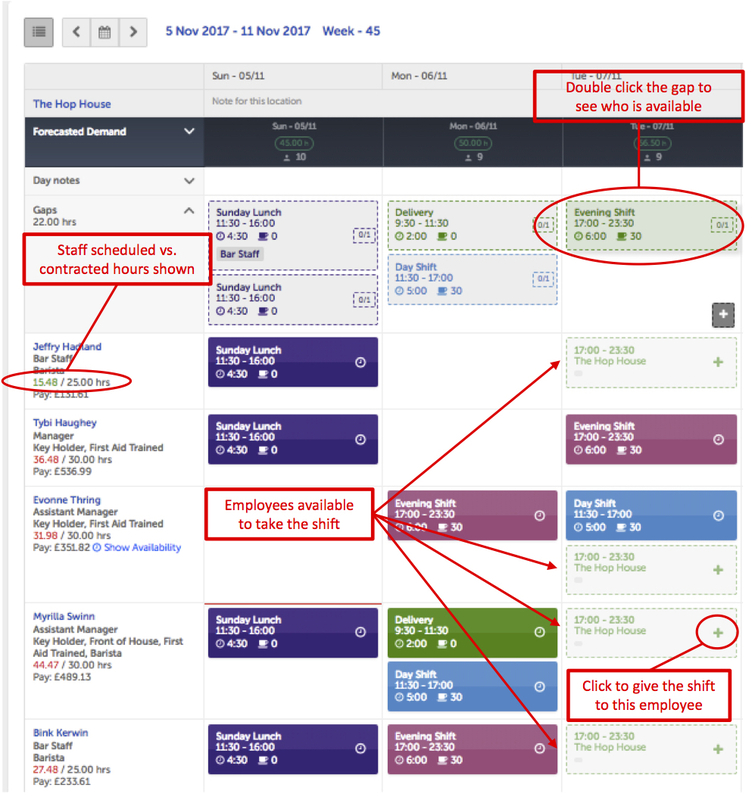 Scheduled hours appear first, and are green if they are less than or equal to contracted hours. These will turn red when an employee has exceeded their contracted hours for the week. Once you've chosen the team member, click on the plus sign where the shift appears in their row. This will move the shift out of the gaps row and add the shift to their rota in draft form. To finalise the allocation, click the Approve Changes button in the top right corner. Instead of just allocating the gap shift to an available employee of the manager's choice, managers can notify their team about the unassigned shift to see who'd like to take on the extra hours. This is done by sending a Gaps Notification. Click the blue Send button in the top right of the screen, then select Send Gaps Notification. This launches a dialogue box where you can decide which employees should receive the notification. When you're done, click Send. A green circle appears in the top right corner of a gap shift when a notification has been sent to your team. Selected team members will now be able to see the available shift via their Employee Mobile App. If they are interested in taking it they can request the shift. When an employee has expressed interest in working a gap shift, the green circle in the top right corner of the gap shift will change to red. Click on the red circle to see who has responded and to assign the shift to them. Employee responses to gap shifts will be listed in chronological order based on when they requested the shift. This helps mangers to ensure fairness. If you are a Store Manager, you will most likely use Gaps across a single location. This means that you can notify the employees in your store about the available shift, and you will be able to choose someone to take the shift from that pool of workers. Some users will have the ability to use Gaps across multiple locations. This means that you can notify employees across several locations about the unassigned shift, and you will be able to choose any available employee across all of those locations to take it on. You are able to put a gap shift in the gaps row of any of the locations you have access to, and assign this shift to an employee in any of those locations. 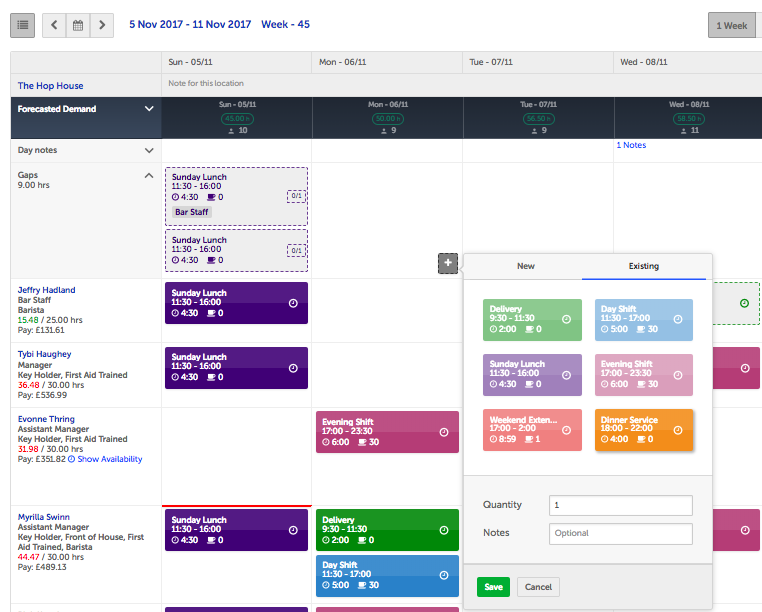 For more information about Viewing and Interacting with Multiple Locations in the Scheduler, click here.